One trend I can’t get enough of is the kimono trend. What a fun easy way to update your look. This kimono from Shein has a pretty green, yellow and orange floral print with an ivory background and black piping. I had to have it as soon as I saw it! It can be worn tied at the waist or left open (which I prefer). My newest Kendra Scott jewelry looked perfect with this outfit, I think. I’m wearing my Elle earrings in Emerald Cat’s Eye which was my first ever Kendra piece and still one of my fav pairs of earrings. Also I layered necklaces with the Jayde Opal Pendant and the Rayne pendant in black (a birthday gift from my friend Lynn!). I just thought the colors really came together well here. I’m wearing my Hudson raw edge cropped flare jeans. Even though these were more than I usually spend on jeans, these ended up being a fabulous buy cost-per-wear since they’re flattering, comfortable, and I love the way they show off cute shoes! Also wearing an asymmetrical tank, Soft Surroundings sunglasses, strappy sandals, and a vintage bag. Last week’s superstar is beautiful Lisa of The Sequinist … isn’t this jacket AMAZING?! Lisa, when you’re tired of it, you know where I am! How is your week going, Dolls? Ready for the weekend? I had a really exciting week this week! The RewardStyle team was in San Francisco and we had a fun blogger meet up and a photoshoot at the latest LiketoKnow.It wall! More fun posts coming … and if you want the behind the scenes scoop, be sure you’re signed up for my weekly newsletter! Kimono CUTIE!! I adore the print and length of this one. You look amazing!! Kimonos have been one of my fave lately too! They just work with everything!! Loved this kimono on you! This outfit is so chic!! Thanks for hosting the linkup! So chic! I love my Rayne Pendant…you’ll wear it all the time. I’m wearing my black on today ❤️ This kimono is fab, great look! Not only a gorgeous kimono but I love the black top and the sandals. I haven’t found Kendra Scott in the UK, yet. I have found Kate Spade so give me time and I may. That kimono is fab! I love the length and the print! You look so chic! Seriously loving this kimono! I have a very similar one and must try it over all black soon. Very nice on all the black! Great colors! I love the way you styled the kimono. Enjoy your weekend! Gorgeous kimono!! Love that you styled it with all black outfit. Love it! SUCH a gorgeous look, the kimono makes such a statement with the black, and love the color of the earrings which harmonize with the kimono. I love kimonos and plan on adding a few more to my collection, this one is so pretty! I LOVE your kimono! I want it! I’m wearing a kimono this week too, but I’m after a longer one like yours for autumn. I really need to get a kimono! Love this kimono paired with the Kendra Scott Jewelry. Gorgeous look! Thanks for the link up. Love the kimono and how you layered the necklaces! Love this look from head to toe! Your kimono looks so great paired with your raw edge denim and your beautiful Kendra Scott Jewelry! Have a great weekend! I have really been thinking I want a kimono and this is seriously convincing me! I adore greens and kimonos! Your look is fabulous! You have inspired me to add more green to my closet! Peace! You know how I feel about kimonos…and that one is definitely a winner! I love, love, love this kimono! I also can’t get enough the trend. I think I have about 30 different kimonos in my closet now and wear one almost every day! What a pretty kimono! Love it with the all black. I think I am going to get those same earrings for a wedding I am going to in Oct. The main color in my dress is green, and they are so pretty! Fabulous look! I love the kimono! I have two short kimonos, but not a long one. I would love a long one like yours. I love this Kimono on you, it looks fabulous! They are such a fabulous compliment to any outfit! I love this look Dawn Lucy!!!! I love Kimonos, and yours is so cute! I love the colors! I also love your longer pendant! Such a pretty kimono! I love the longer length, it looks great worn over jeans. Those earrings are beautiful and I love your vintage bag! Love this look! 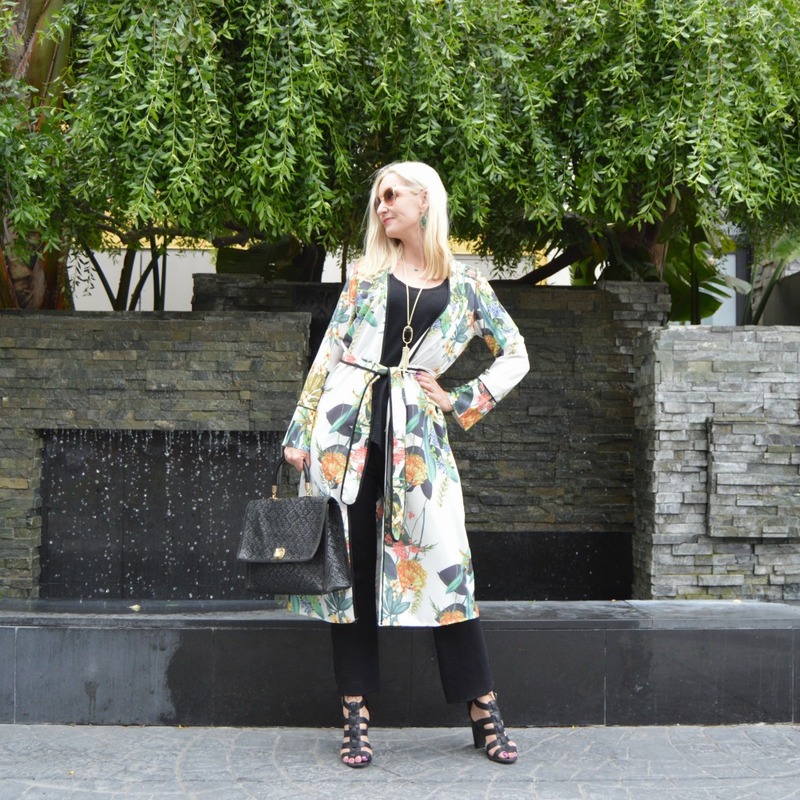 Kimono’s are the best – I need more of them! !